The Mad Monkey Hostel is a relaxed and fun hostel with a brand new swimming pool and poolside bar located close to the famous pub street in Siem Reap and close to the amazing temples of Angkor Wat, As the premier provider of hostel accommodation in Cambodia our hostel sleeps 70 people a night, many of whom you are destined to meet in the ONLY rooftop beach bar in Cambodia. If you are looking to meet other backpackers and travelers and want the benefits of an active bar scene in addition to a clean and comfortable room, good food, a chilled beach vibe and all of the other amenities that you would expect from a top hostel then come stay with us! We are western and Khmer run and owned so you get to have all of the authentic Khmer charm with western levels of service. We have a coffee shop on the ground floor of the hostel serving coffees, cakes and ice cream and packed lunches for the temple tours open every day. 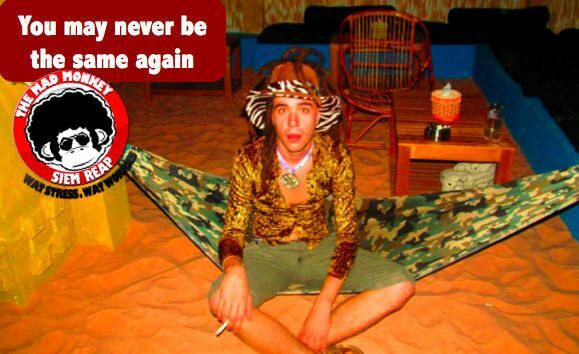 On the rooftop level you will find the only original rooftop beach bar in the whole of Cambodia! The bar is open all day and has comfortable seating, hammocks and everything else that you would expect from a beach bar. Open until 1am (sometimes later) its a great place to hang out and meet others! We are almost always full so if you want to meet others traveling around Cambodia then The Mad Monkey is the place.Hostels like ours in Siem Reap provide you with a fun and awesome way to meet up with fellow backpackers that are getting loose, having fun and probably spending more time at the bar, on tours or mixing with others than in their room admiring the thread count of their duvet. It is for this reason we do not provide TV's in the rooms, in fact when we took over this hostel in Siem Reap we had every TV apart from the communal one in the bar removed. 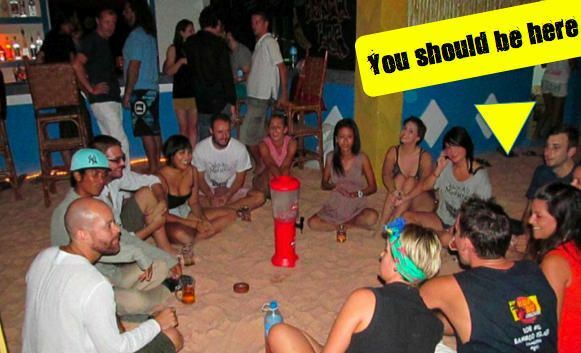 Because of this we have a thriving bar scene that actually pulls people in from Pub Street to the Mad Monkey hostel just to enjoy the only rooftop beach bar in Cambodia. Every room is cleaned every day, every room has comfortable beds, nice pillows and all of the basics like a mirror for you to apply your lippy and dance in front of. We have lots of different room choices ranging from doubles with A/C, private balconies, budget low cost accommodation and mid range rooms. We also have options for triple rooms and we provide a large dorm of 12 and two small dorm rooms of six with the biggest dorm beds you will find in Cambodia.